Eau de Génie is a multi-tasking facial toner. Organic, it is basically fruits (lemon, grapefruit, apricot and tomato) water that revitalises, tightens pores and soothes skin while also removing micelles. It is also brightening and lightly moisturising as it contains lemon peel oil. Because it is so gentle, it is suitable for all skin types and adolescent skin. It also works really well as a refresher; it behaves well over makeup. You can even keep it in the fridge! As a toner, apply to cleansed skin and remove it a cotton pad, without rinsing. Skin feels fresh and comfortable after use. personally, I find it great as a facial mist. And if you suffer from breakouts like me, you might want to use, in conjunction with Eau de Génie, the Gimme Clear! lotion. In reality, it is a light oil that smells rather herbal formulated with natural essential oils and vegetable oils, such as hazelnut, hemp seed, carrot, citrus peel, cinnamon bark and oregano flower, to purify and help reduce sebum and shine in the skin. It works on blemishes and spots prevention, by helping declog pores and also aids in healing existing pimples. As it is an oil, it also contributes to skin hydration and improved texture. One pump is enough for the face; the oil is light and absorbs quickly. I personally prefer using it at night, sometimes I just rub it on the blemishes themselves instead of using on the whole face. You can get Indemne on their website. Eau de Génie cost £15.53 (135ml) and Gimme Clear! £18.42 (50ml). They also do haircare and beauty accessories. 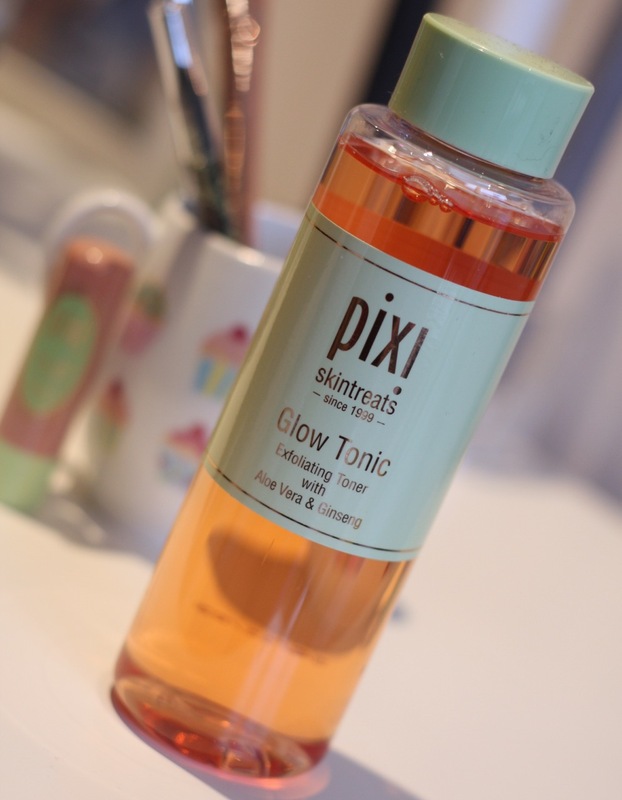 A toner is a must in my skin routine, twice a day – and in the past weeks, I’ve been giving the Pixi Glow Tonic a go.